Do you work in a demanding environment that requires the utmost in safety and precaution, but also need the comfort and support of an orthopedic shoe thanks to the painful effects of plantar fasciitis? Don’t live with foot pain anymore: here are our top six picks for the best work boots for plantar fasciitis for men and women in 2018. Work boots haven’t always been designed to be comfortable. For most of history, they’ve instead been crafted to hold up in rough work environments, whether on the farm or in the factory. They need to last through wear and tear that would rip other shoes to shreds, and for the most part, comfort has always been a second though. Now, high-quality footwear manufacturers are releasing a number of great work boots with enhanced comfort and support – perfect for men and women who suffer from plantar fasciitis and other similarly painful orthopedic conditions. So if you need to wear work boots but are tired of sacrificing your feet’s comfort, you’re going to want to keep on reading and take a closer look at our top six picks for the best work boots for plantar fasciitis. A solid choice for any buyer suffering from plantar fasciitis, the Justin Original Double Comfort 4760 comes equipped with extra support for even the toughest working conditions. Hand crafted in the United States out of the highest quality leather ingredients, the Justin Double Comfort is made for comfort, support, and durability. 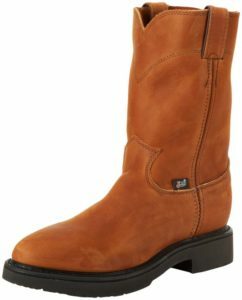 Perfect for the wearer who hates to ‘break-in’ new boots, the Justin 4760 comes ready to wear – they feel like they’re already broken in from the first time that you pull them on. A longtime favorite among many boot wearers, the Justin Original Double Comfort 4760 takes our top spot for the title of best work boots for plantar fasciitis for men. Great for anyone who works in a potentially hazardous environment, the KEEN Utility Milwaukee 6” Steel Toe provides the comfort that sufferers of plantar fasciitis demand, while still offering all of the protection of a high-quality work boot. Thanks to their steel toes, slip-resistant sole, and electrical protection, the KEEN Milwaukee is a great all-around mid-rise boot for plantar fasciitis. 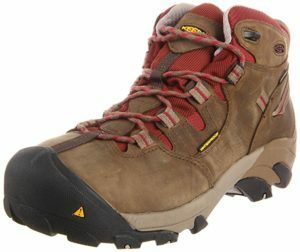 These boots feature KEEN’s proprietary Welt Construction for increased durability and long lasting quality. Complete with a removable metatomical EVA foot bed, the Keen Utility Milwaukee provides comfort and support from the moment you put them on in the morning until it’s time to take them off at night. Another pair of high-quality mid-rise boots, the Timberland PRO Boondock 6” Non-Insulated work boots are great for plantar fasciitis thanks to their built-in shock absorption Anti-Fatigue technology. 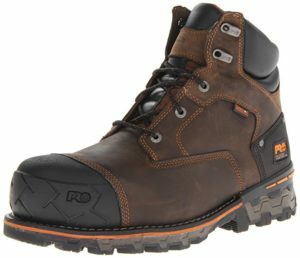 They also boast Timberland’s great PRO rubber to protector, a light-weight alternative to steel toes, as well as a premium waterproof leather construction and additional waterproof membrane. With the Timberland PRO Boondock boots, you can rest assured in knowing that you’re getting boots which feature a roomier fit, cement heel construction, a lightweight and durable midsole, and maximum support for impact zones like the heels and balls of your feet. Best yet, the Timberland PRO Boondock 6” Non-Insulated work boots come with Timberland’s 30-Day Comfort Guarantee. 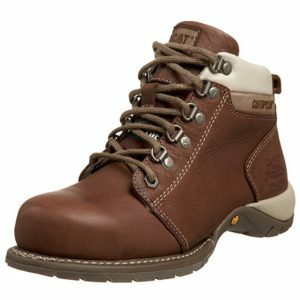 Starting out off list of the best work boots for plantar fasciitis for women is the classic Timberland PRO Titan Waterproof. Crafted from waterproof full-grain leather uppers and a thick and durable rubber sole, the Titan Waterproof is made to withstand harsh work environments while still providing all-day comfort and long-lasting durability. The Timberland PRO Titan is a good pick for women who don’t want to deal with breaking in new, stiff work boots. Unlike many other competitors, these boots are ready to go straight out of the box. Enhanced for increased safety, the Timberland PRO Titan Waterproof features an open-cell polyurethane foot bed, mesh comfort lining, and an energy-returning rebound heel insert. For the woman searching for a super durable steel toe work boot for plantar fasciitis, the Caterpillar Carlie Steel Toe Boot is a good pick. From the EVA cushioning designed to keep you comfortable while standing on your feet all day long to the Ortholite foot bed which provides climate and odor control, you can experience enhanced comfort from the moment you put the Caterpillar Carlie on. Boasting Caterpillar’s proprietary iTechnology, the Carlie Steel Toe Boots provide the support and safety of work boots while also offering the comfort and flexibility of athletic shoes. These boots are a great choice for anyone who suffers from plantar fasciitis, as well as those who have dealt with surgery and other serious foot issues in the past. 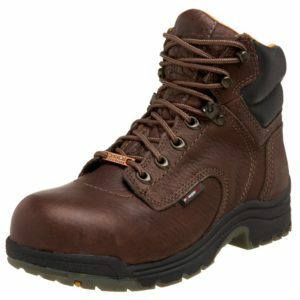 Long known as one of the most comfortable and durable brands of outdoor boots on the market, KEEN has earned an equally strong reputation for itself in the work boot world thanks to its quality line of on the job footwear, including the comfort-focused KEEN Utility Detroit Mid Steel Toe Boot. These boots aren’t just comfortable, however; they’re also practical for tough work environments. 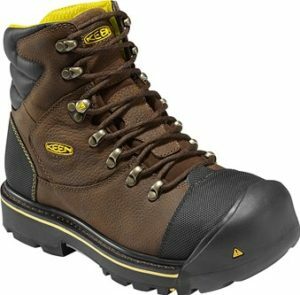 With ample padding to keep you in comfort all of the way to the end of the day, a solid steel toe for maximum protection, and a waterproof design meant to keep your feet dry in wet environments, the Keen Utility Detroit Mid Steel Toe Boot is rugged, protective, and most of all, comfortable. In a hurry and looking for a quick breakdown of the best work boots for plantar fasciitis for men and women in 2018?